The climbing in Omis might not be world class, but the easy accessibility by bicycle made it to one of our favourite climbing areas. From the campsite in Omis, it is a short 5 min bike ride to the climbing areas and you can more or less belay from your bicycle. In Omis, several shops and markets provide everything you need. The beach close by is perfect for a relaxing rest day or to cool down after climbing. As most climbing is in the shade, it is also a great climbing spot for the summer. 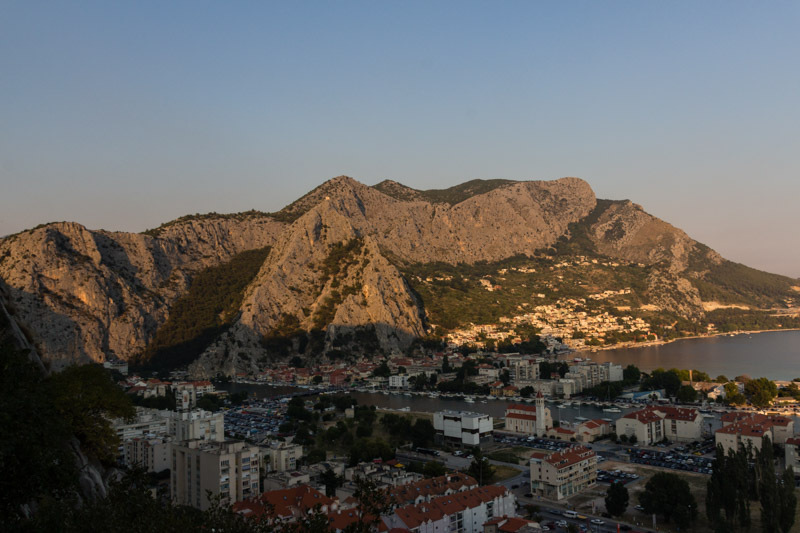 You can find more about our time in Omis in our blog post. The town of Omis, surrounded by rock climbing walls and a beautiful beach. 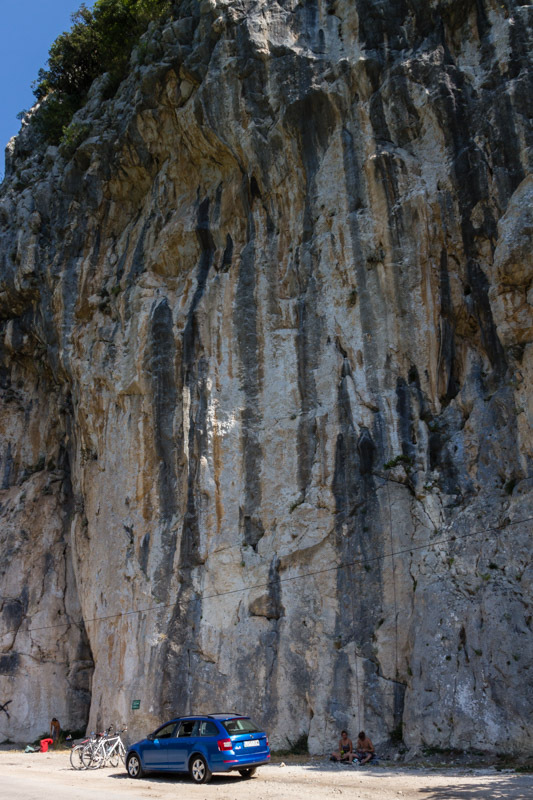 Rock and routes: Omis provides several good climbing areas and is dominated by grey limestone. The rock quality is great and the routes are mostly vertical. The sector ‘Visoke Pole’ has several overhanging tufa routes and was our favourite. Climbing area and environment: The surrounding around the climbing area is not the most impressive, as it is directly next to a road. During the day several buses or even trucks parked directly next to the climbing wall and sometimes even blocked routes. Guide book and information: For Croatia we used the 8th edition of ‘Croatia Sport Climbing Guidebook’ by Boris Cujic. It covers all climbing areas in Croatia, except Paklenica. The topos are detailed photo topos and it includes all important information about access, season and grades. Omis offers a wide range of climbing grades, starting in the 4th French grade up to the 7th French grade. Not a lot of hard routes above the 8th grade are available. More or less all year round. There are climbing walls in the sun or in the shade, so you can choose according to the weather. The strong wind called ‘Bora’ can be a problem. Climbing wall in Omis, directly next to the road, which makes it easily accessible by bicycle. Accommodation: Omis has lots of options for accommodation, including two campsites. We stayed at ‘Auto Camp Lisicina’ (www.ac-lisicina.hr), which is nicely situated next to large rock walls. The campsite has clean sanitary facilities and also a good kitchen. As we were there in high season, it was rather busy, but still quiet. Access to food: Lots of different supermarkets available in Omis. Access to water: Running water at the campsite, but not at the climbing area. Access by bike: Perfect access! Everything is flat, no problem to get to the campsite and supermarkets. The climbing areas are just around the corner from the campsite and are directly next to the road and you can more or less belay from your bicycle.